How do I Prevent Water in the Basement when the Back Yard Slopes Toward the Back of the House? Flooding is common in many areas of the United States and causes a great amount of damage to homes. Flooding often comes in through the basement and rises up into the house. Bad flooding can cause electrical and structural damage to the home, which in some cases can be impossible to repair. There are ways to keep flood water out of your home and prevent disastrous floods. The solutions are cheap and can be done without the help of a professional. Flooding can cause expensive damage to your home. Fill sandbags half full with sand. Dig a trench around the home that is one sandbag deep and two sandbags wide. Place sandbags into the trench. Make the base three times as large as the top. If you want a 2-foot-high wall, make the base 6 feet wide. Lay the first layer parallel to the water flow, the second layer perpendicular, then the next layer parallel, alternating between the two as you build the wall. Set bag the sandbags so that the wall looks like a pyramid. Tamp the entire sandbag wall down using a hand tamper to pack it tight. Extend the length of your gutters to 10 feet out from the house. Slide new gutter pieces into the existing gutters to extend them. 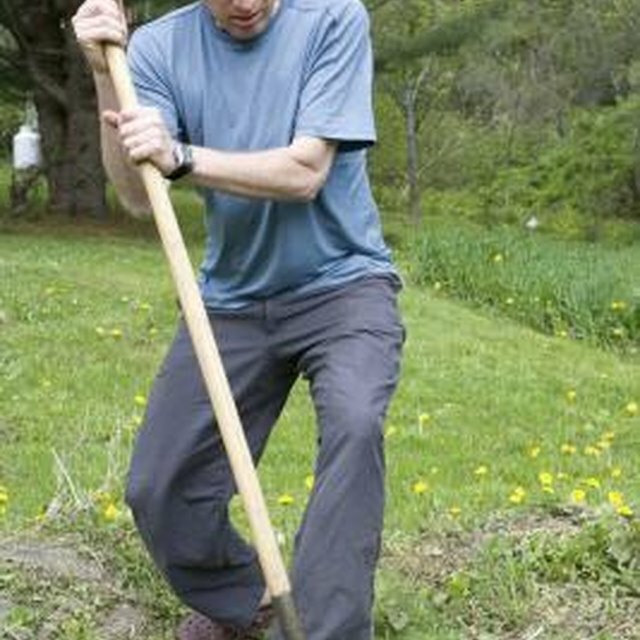 Grade the yard by adding more soil at the foundation of the home. Grade the yard so that there is a 1 percent slope leading away from the home foundation. Add 1 inch of slope per every 5 feet of turf. Remove plants from around the house foundation. Plants collect water and keep it from draining away from the home. Dig a V-shaped trench around the house foundation. Dig the trench so that it leads away from the home. Line the bottom of the trench with plastic. Lay a perforated pipe at the bottom of the hole and cover it with gravel, so the trench is filled almost to the top. Cover the gravel with soil. Water will seep into the trench and move away from the home. Clear out all drains around the yard regularly to prevent blockages that may prevent water from draining. Check the drains after the winter and in the fall before winter. Check the basement walls for any cracks and seal them to prevent water from coming in. Inspect the seals around any basement windows for decay and scrape the old caulk off using a putty knife if old. Install new caulk using a caulking gun.